The Hampton Inn Doylestown PA hotel is located on Route 611 in Warrington Pennsylvania just minutes from downtown Doylestown and the Willow Grove-Horsham Business Park. Our hotel guests can enjoy nearby Philadelphia Pennsylvania attractions such as shopping malls horse racing Peddler*s Village Sesame Place historical sites and the Philadelphia Zoo America*s oldest zoo. The Hampton Inn Doylestown hotel features a five story interior corridor property with 78 beautifully appointed rooms and suites all equipped with microwave ovens and refrigerators. While staying with us please make use of our heated indoor swimming pool and fitness area. If it*s business that brings you to Pennsylvania the Hampton Inn has meeting rooms with over 1 000 square feet of space. Whether traveling to the Philadelphia Pennsylvania area on business or pleasure Hampton Inn hotel guests can enjoy amenities which include a complimentary deluxe hot and cold breakfast buffet complimentary wireless high-speed internet access and a 24 inch flat screen LCD television with Direct TV. Guests can also request connecting rooms rollaway beds and cribs. 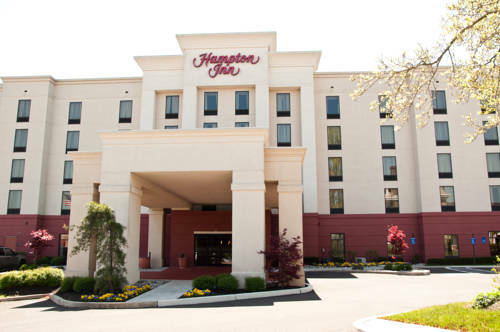 We love having you here in Warrington Pennsylvania at the Hampton Inn Doylestown hotel. A four-acre pile in the middle of the woods, where boulders, when struck, emit a sound more musical than the typical rock thud (if you remember to bring your hammer). But Mom says I have to quit hitting everything with a hammer. Honoring Philadelphia's hometown hero, one-third of The Three Stooges. Supposedly marks his birthplace. Originally painted in 1999; new version painted in 2005. A neighborhood museum dedicated to the human party favors -- The Mummers -- who parade through Philadelphia each New Year's Day. Hometown Philly boy became an opera tenor and movie star, but died at age 38.